This week's poll continues to be bearish. 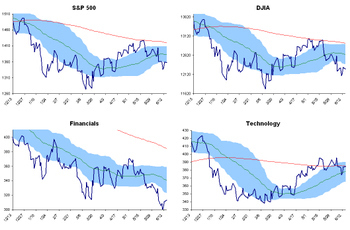 Birinyi Associates' monthly newsletter, Reminiscences, equips readers not only with detailed market commentary, long term views, stock ideas and model portfolios, but has also introduced several ways to analyze the S&P 500 sectors. 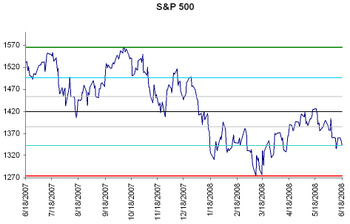 Shown below, the S&P 500 financial sector recently bounced off its theoretical low. 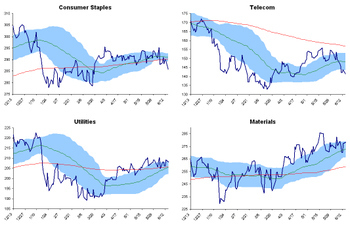 Also highlighted is detailed sector information with year-to-date and month-to-date performance, upgrades and downgrades by sector, changes in price target and EPS estimates, as well as the best and worst stocks for the month and the year. Based on performance, earnings, price target, analyst ratings and changes Birinyi ranks the S&P 500 sectors highlighting the best and worst. Included in this month's issue is a summary the upcoming earning's season. The largest stocks to report, when they report, changes to their estimates and the stocks' average performance on an earnings report. Click here here for more information and subscription details. Laszlo Birinyi will appear on Bloomberg TV tonight (June 25th, 2008) to discuss the US Equity market and this month's newsletter, scheduled to be published at 5pm. 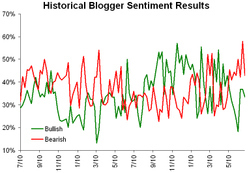 Bloggers are bearish for the week. 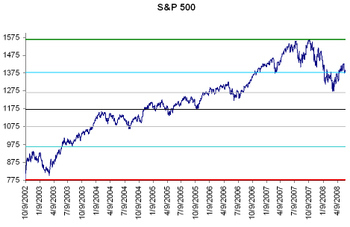 One of the more interesting and esoteric technical trading tools is the Fibonacci Retracement. For those not familiar, the retracement breaks down a particular range into five percentiles (seven including the maximum and minimum). The key numbers are 0%, 23.6%, 38.2%, 50%, 61.8%, 76.4% and 100% (0% and 100% are obviously the max and min). The biggest problem we see with this kind of analysis is the fact that it is backward looking. 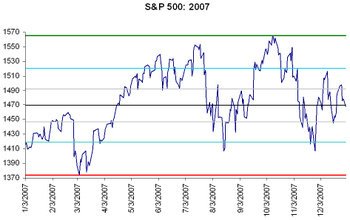 The chart shown immediately below illustrates the S&P 500 over the last year, with the key lines drawn. Quite different, although the bottoms do still occur at one of the key lines. Another difficulty when examining retracements is determining appropriate maximum and minimum values. When we looked at the last year (the first chart) we see that after bottoming the S&P 500 rallied to just above the 50% line which also coincided with the 200-day moving average making a strong case for resistance. Below we show another retracement beginning on 10/9/02; the start of the 2002 bull market as defined by Birinyi Associates. As shown, the 61.8% line came into play at the March bottom, while the 76.4% line is currently in play as some possible support. Our problem with this indicator is that while it looks enticing and accurate on the chart, the market rarely turns "on the line." 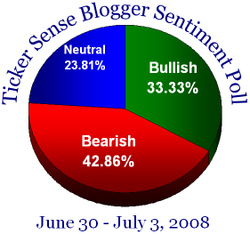 If we look at the chart of 2007, and say we had bought the market on the 23.6% line at 1420 on 1/4/08 our investment would have declined to 1270 (-10.5%) over the next two weeks. In hindsight that may count as a breakdown, at the time we would have been buying on support. 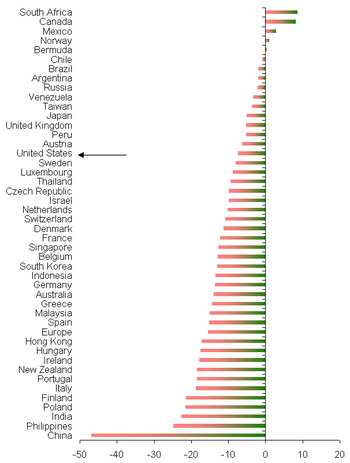 Bottom line: the charts are interesting and sometimes surprising, but are less useful as investment tools. After making an intra-day high of $139.89 this morning, crude oil has drifted lower throughout the day, finding a low at about $133. 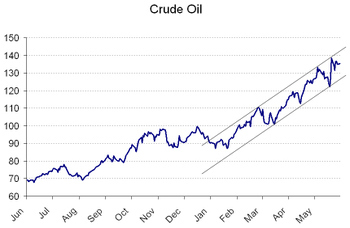 The chart below highlights the upward channel that crude has held since the rally from $90 to $110 that began on February 2nd. From a technical perspective there is now support at $130 and $120, a broken uptrend is most likely to result in the kind of sideways trading seen between October and January. 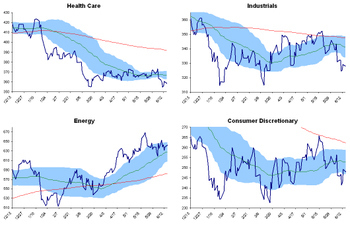 Shown below are the S&P 500, DJIA and the ten economic sectors making up the S&P 500. 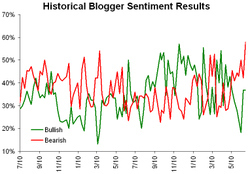 Both the S&P and the Dow encountered strong resistance at their 200-day moving averages and quickly retreated below their respective 50-day averages. 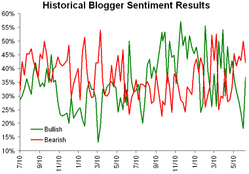 The Dow remains oversold while the S&P has traded up into the bottom of its range. Technology and materials have tried to re-establish an uptrend, but the only consistent winner is energy (red 200-day trending up). For more information regarding trading ranges for sectors, industry groups and individual stocks; including theoretical extremes and standardized daily price moves, click here to learn about more products and services offered by Birinyi Associates. There are still more bears among the bloggers. Birinyi worked for about 12 years on the trading desk at Salomon Brothers before starting his research and money management firm in 1989. He said in an interview with Bloomberg TV on May 21 that shares of U.S. energy companies have climbed too fast, leaving investors vulnerable to losses. The S&P 500 Energy Index has since declined 3 percent. Birinyi said on April 8 he bought shares of Apple Inc., the maker of iPod media players and Macintosh personal computers, and Google Inc., owner of the most popular Internet search engine. Apple has since climbed 20 percent, while Google has gained 21 percent." For the full story, including a video clip of Mr. Birinyi's appearance, click here for Bloomberg's website.